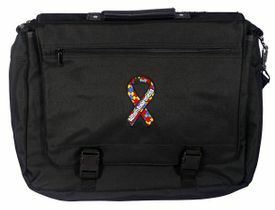 This durable black briefcase features the Autism logo embroidered on the front and is a great way for you to show your support at work. It is perfect for laptops. It comes with a shoulder strap as well. The inside flap has two zippered pockets, one Velcro pocket and several smaller pocket for pens, cell phone, etc. It is ideal for school or office. Makes a great gift. This durable black briefcase measures 18"" w x 14"" h and expands to 6"" across the bottom. Check out our full selection of Autism Spectrum Products!